The CBI court on August 30 framed charges and ordered trial of Dayanidhi Maran and 6 others in the case of 'illegal' telephone exchanges. 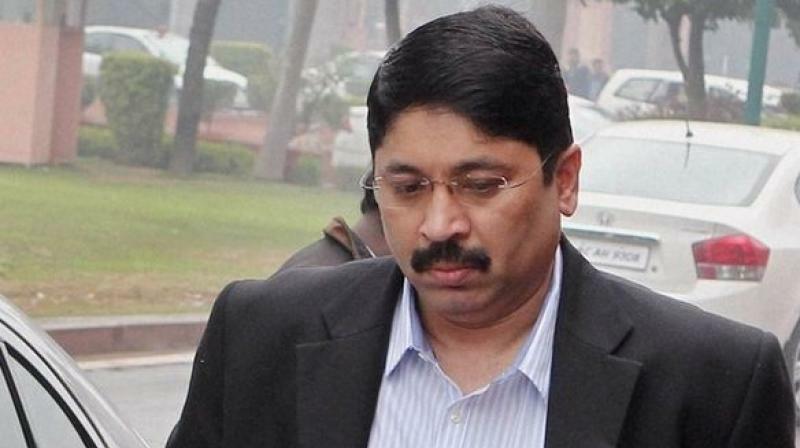 Chennai: Former communication minister Dayanidhi Maran and his elder brother Kalanidhi Maran told the Madras High Court Friday that charges framed against them in a case of alleged setting up of illegal telephone exchanges were "lame and shame" and wanted them to be quashed. Charges have been framed by a CBI court based on the investigating officer's opinion and not on materials available on record, contended senior counsel Neeraj Kishan Kaul who appeared on behalf of Dayanidhi Maran before Justice A D Jagadish Chandira. The CBI court here on August 30 framed charges and ordered trial of Dayanidhi Maran and six others in the case of "illegal" telephone exchanges, allegedly set up to benefit the Sun TV Network of his brother Kalanithi Maran during 2004-06. The petitions seeking quashing of charges came up when the trial was slated to commence Friday at the CBI court. Kaul argued that the restriction to have only three connections would apply only to MPs as per the Salaries and Allowances of Members of Parliament Act and not to a Cabinet minister. "There is no statutory bar for a minister to have more than three telephone service connections," he argued. The former minister did not have 764 telephone connections as alleged by the CBI, and even if he had, there was no statutory bar against it, he said. "In the entire charge-sheet, there is no single word saying that the connections were used by the minister. The CBI has only said that it could be used, or can be used," Kaul said. All the accused who are facing trial, except officials of the BSNL, have moved the Madras High Court, seeking to quash the charges framed by CBI in the illegal telephone exchange case. Kaul also contended that there was no evidence to prove that such connections were used, adding, "telephones cannot be used for broadcast. There is absolutely no evidence to prove that the lines were used for programmes of Sun TV." On the charge of forgery, the counsel said the prosecution failed to explain it and which documents were forged. Arguing on behalf of Kalanidhi Maran, senior counsel Amit Desai said Kalanidhi has been arraigned as an accused as he is the chairman of the Sun Network. "The CBI has alleged vicarious liability by designation. But such liability cannot be automatically included when the statute does not provide for it. Both in the Indian Penal Code and Prevention of Corruption Act, there is no scope for vicarious liability," Desai said. Apart from the two, then additional private secretary to Dayanidhi was represented by senior counsel P Wilson and the chief technical officer of Sun TV S Kannan, by senior counsel A R L Sundresan. The judge directed the CBI to file its counter petition and posted the matter to October 3. The charges date back to the time when Dayanidhi Maran, a grandnephew of late DMK chief M Karunanidhi, was the Union minister for telecommunications and information technology in the UPA-1 government. The CBI has alleged he misused his official position and got private telephone exchanges installed at his various residences here which were used for business transactions of the Sun Network. The high court had on July 25 held there were 'heaps' of material evidence against the accused and had directed the special court to frame charges and conclude the trial within a year. The bench had given its order on a CBI plea, challenging the discharge of the accused by Special Judge S Natarajan on March 14 this year. TD leaders promised to contribute towards the project but did not so far.